My final post here on Degrees Unedited. What a great experience it has been during the last couple of years to collate my reflections here, within the framework of mutual learning and adventure. One of the unexpected outcomes of writing posts is what happens when one sits down and begins. The process has revealed to me, my own thoughts, connections and ideas. I feel this is a place where authenticity is valued and this has built my confidence in my practice. Thank you. The work I selected to present for my final presentation was grouped under one title, Tea Garden with a series number. The title begins to develop once the work is started. I search for a word that divides into two, which then opens it up to other readings, as in the previous titles I have used, New Land and Rose Land. This title references the jazz trombone player Jack Teagarden, who I have listened to exclusively whilst making the work. The two words Tea Garden hint at other places and times, another form of movement perhaps.There was a Jack Teagarden album in my childhood home, an early sound memory. My use of colour is guided by wanting to secure a chord or hum. 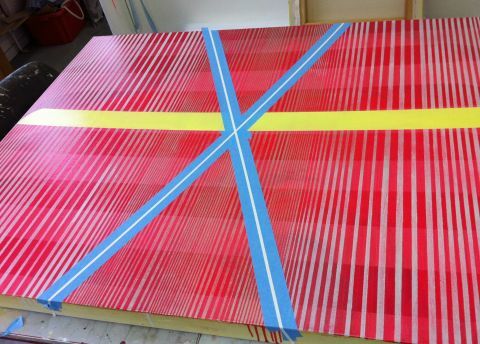 My work is not about landscape or pattern making neither is it a comment on contemporary urban life. 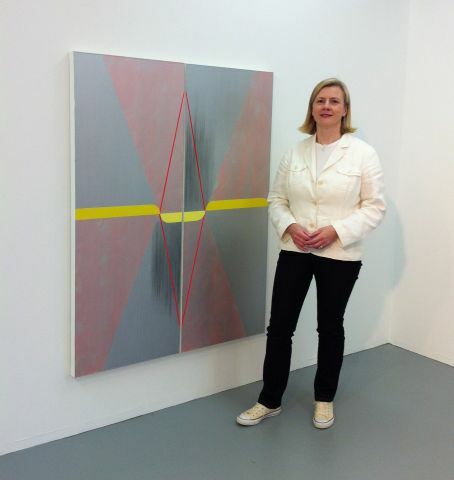 Rather it is about giving visual voice to a practice of seeing, moving and being; the point at which kinaesthetic senses are actively connected to the visual senses and inner experience. Physical and emotional elements have been drawn together into the work and now exist as a witness to place, person and purpose. 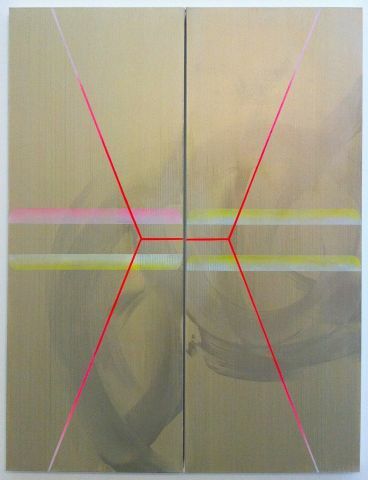 The memory of surface and edge connects the work to place and touch, vinyl, melamine, linoleum. Books covered with plastic and cloth. Foil and cellophane sweet wrappers. The surfaces and contents of the homes of my grandparents. These elements contribute to an opening up of ‘hard to place’ time period, not nostalgia, but a now of then; a double reading, as with listening to live recordings of music, a double listening. Nearly a month has past since the final assessment, the results are due on Friday. As with other graduating students my unwinding mind has been full of flashbacks to earlier work and tutorials. I have thought more about the first year in the last few weeks that ever. What was I looking for, what was I hoping would happen? I was advised in my first summative assessment to find out what my work was about. This has been my pursuit in everything I have done, essays, sketchbooks, paintings. 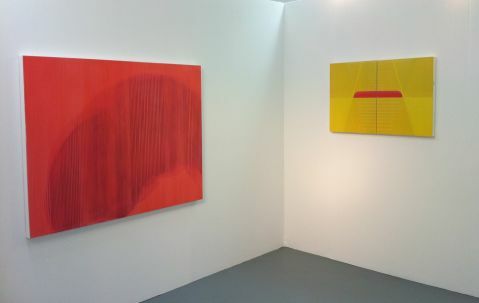 I have a compulsion to make work, to make connections with the history of geometric abstraction and to look for echoes and rhythms in the places of today. I have discovered that for me there is a vital link between the act of seeing and the physical awareness of moving. These two activities are deeply satisfied by solitary walking in New York and London. Then there is the outputting of visual information and the physical experience of re-enacting this by painting and drawing in the studio. Walking in the city and working in the studio is a twofold activity. The rhythm of one setting the structure of the other. The architectonic geometry giving playful organisation to the space, the gesture establishing the experience and feeling of physical motion. Hand held film showing detail of ‘Tea Garden 002’ 2012, Marion Piper. 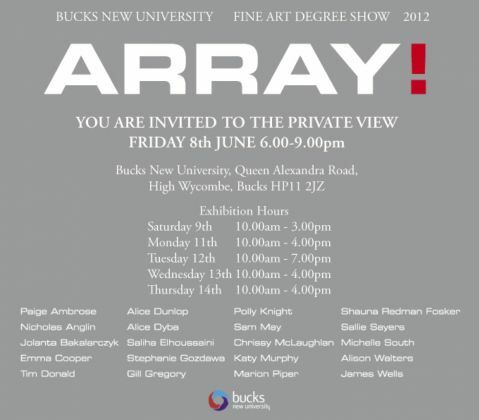 Bucks New University Fine Art Degree Show 2012 opens later today Private View 6-9pm Come along if you can! So the final strokes of paint at uni. Five years of making work have as an undergraduate have ended with a swoop of neon red oil glaze. One of the first projects I stumbled though in 2007 was to work with a narrative inspired by objects. I tried to recall some my earliest visual memories. Aged five, I was deeply impacted by a huge shimmering, glossy, saturated red monochrome surface. The gable end wall of a house covered in the red leaves of virginia creeper. Other experiences around the same time, the feel and colour of certain fabric, colour, places, smells and music are early touchpoints that began a personal sensory palette or chord scale that I now play.